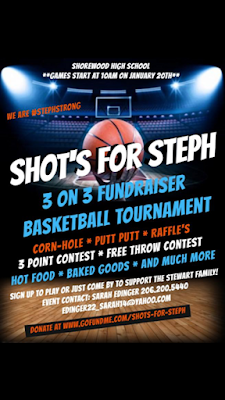 Shots for Steph Fundraiser: 3 on 3 Basketball Tournament and other fun family activities! Because no one fights alone! Join us for a fundraiser benefiting Stephanie Stewart, a Shorewood High School Alum and Shoreline resident. Stephanie was diagnosed with endometrial and uterine cancer in April 2018. She's a fighter (#stephstrong), but the cancer is giving us a battle, having now metastasized to her brain, hip, lungs and liver. After a number of surgeries, Steph is again undergoing radiation and chemotherapy. All funds raised will be used to help with medical bills, the cost of treatment and living expenses, as she is not currently able to work. 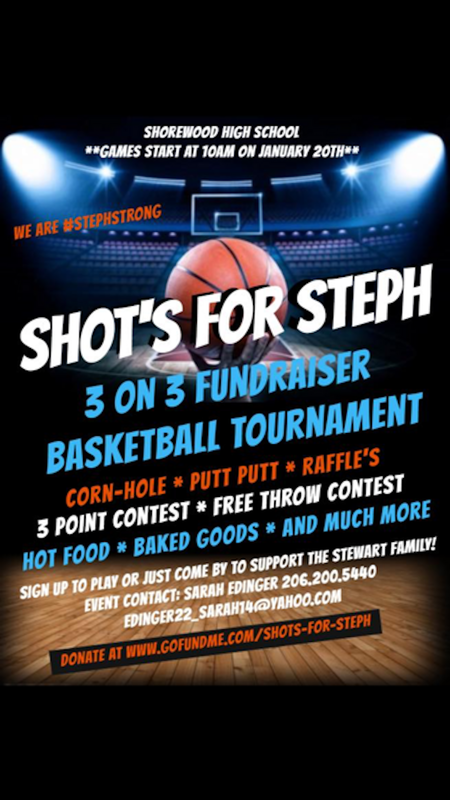 Come cheer Steph on in her battle and have some fun with an all ages 3 on 3 tournament, corn hole, 3 point/free throw contests, a coloring station and food! We will also have raffles - including a chance to win an F/V Northwestern jacket, autographed by Capt. Sig Hansen of the Deadliest Catch! Can't make the fun but want to help out? Donations of any amount are greatly appreciated! To register your team or for more information, contact Sarah Edinger at 206-200-5440.